This article is about the night elves' lore. For the playable race, see Night elf (playable). Night elves (or kaldorei, for "Children of the Stars" in Darnassian), are a powerful and mystical race whose origins extend back to ancient times. These then-immortal beings were among the first to study magic and let it loose throughout the world nearly ten thousand years before the First War. The founders of a magical and advanced civilization which at its peak spanned the breadth of ancient Kalimdor, the night elves came into a horrific conflict with the Burning Legion but achieved a Pyrrhic victory that ended in the Great Sundering, turning Kalimdor's landmass into the continents of the present age. The devastation wrought by the chain of events birthed in conceit caused a wholesale shift in direction. The night elves abandoned the use of arcane magic, fearing its use would draw the Burning Legion back to their world. The main survivors of the Sundering crafted a radically different society centered around druidism, the harmony with the natural world and its denizens. The far-reaching and ancient legacy of the night elves shaped them into a race of very self-sufficient and self-conscious individuals, who often display strong streaks of isolationism. The night elves ended a long period of seclusion referred to as the Long Vigil in the aftermath of the Third War, standing with refugees from the Eastern Kingdoms during the Battle of Mount Hyjal. They then began to associate themselves with the Alliance in response to the Horde's presence in Ashenvale. Concept art for the Dark Trolls, ancestors of the night elves. Around 15,000 years ago a tribe of dark trolls unconcerned by the battles for land and power and longing for a peaceful connection to the world, came to settle near the translucent waters of the Well of Eternity, the prime source of all magic on the planet. Over time, the Well's cosmic power affected this nocturnal and independent tribe, suffusing their flesh and bones, elevating their forms to match their graceful spirits. They transformed into highly intelligent and virtually immortal beings. Their skin turned various shades of violet, and they grew stronger and taller in stature. The tribe gradually abandoned their ancient heritage and tradition. The mystics began worshiping the moon goddess Elune, who they believed slumbered within the fount's depth during daylight hours. The former trolls also discovered the name "Kalimdor" and other titan-forged words from communing with Elune and investigating strange artifacts scattered around the Well's periphery. They adopted the name kaldorei, which meant "children of the stars" in their native tongue. The early night elf priests and seers studied the Well with an insatiable curiosity, driven to plumb its untold secrets and power. As their society grew, the night elves explored the breadth of Kalimdor and encountered its myriad denizens. The trees, flowers, and woodland creatures watched the night elves flourish, whispering news of them to the Wild Gods of Mount Hyjal. In time, the night elves' curiosity led them to meet and befriend a number of powerful entities, not the least of which was Cenarius, a mighty demigod of the primordial forestlands. The great-hearted Cenarius grew fond of the inquisitive night elves and spent a great deal of time teaching them about the natural world. Cenarius adored the night elves and believed they had the potential to become great caretakers of nature. He befriended the fledgling race and taught them about the natural world. It was Cenarius' hope that the night elves would strive to live in harmony with the wilds. The tranquil kaldorei developed a strong empathy for the living forests of Kalimdor and reveled in the harmonious balance of nature. This grew alongside their curiosity of the Well and their continuous draw to its arcane essence. For many centuries, the night elves lived in harmony and balance with the world and their natural affinity for the arcane. They built a graceful society around the Well of Eternity and the capital of their small nation Elun'dris or "the Eye of Elune" sat on the shores of the font of power, where they continued uncovering the secrets of the Well and honing their ties with the surrounding woodlands and their myriad inhabitants The only creatures that gave them pause were the ancient and powerful dragons. Though the great serpentine beasts were often reclusive, they did much to safeguard the known lands from potential threats. The night elves believed that the dragons held themselves to be the protectors of the world, and that they and their secrets were best left alone. Cenarius guided the night elves when necessary, pleased by the wisdom and benevolence that thrummed in their hearts. Zin-Azshari, ancient capital of the night elves. In time, many of the night elves yearned for a different life, drawn to the arcane, they became obsessed with unlocking the Well of Eternity's secrets. They rigorously studied the fount's arcane energies becoming learned sorcerers. They harnessed the powers of the arcane lake and constructed wondrous temples and roadways around it. Magic became an inseparable part of life as the night elves reveled in the power at their finger tips. Pushing the boundaries of their intellect became the driving force of their culture. It was during this era of unprecedented growth that Queen Azshara came to power. She was adored by night elves of every social standing, seemingly immune to the ire the lower castes developed against some of their Highborne nobles. The elves were so enamored with her that they renamed their wondrous capital Zin-Azshari, or "the Glory of Azshara". Sharing the priests' curiosity towards the Well of Eternity, Azshara pushed the educated Highborne to plumb its secrets and reveal its true purpose in the world. The Highborne buried themselves in their work and studied the Well ceaselessly. Only the openly hostile troll nations drew the full attention of the elves. Despite the trolls' attempts to keep this new race from claiming further territories, the night elves built up the mighty Kaldorei Empire that expanded rapidly across Kalimdor. Not since the Black Empire in ages past had a territory grown so vast in size and scope. The immense influence Azshara held over the world and its denizens eclipsed even Lei Shen's wildest dreams of power. Empowered by the Well and wielding fierce magics never before imagined by the trolls, the night elves soon threatened the two greatest empires on Azeroth: the Amani and Gurubashi. The night elves systematically dismantled the troll's defenses and supply chains. Unable to counter the elves' destructive magics, the trolls buckled under the onslaught. The territories of the Gurubashi and Amani empires fragmented within only a few years. The elves however were not interested in conquest. In the eyes of Queen Azshara, the trolls were a minor nuisance, their battle lust a symptom of primitive and unenlightened minds. Ultimately, the queen struck an accord with the Zandalar tribe, which held immense influence over all other trolls. In exchange for ending troll incursions into night elf territory, the Zandalari would be allowed to keep the sacred Zandalar Mountains south of the Well of Eternity. Fully aware they stood no chance against their enemies' arcane powers, the trolls begrudgingly agreed. The night elves' shockingly quick victory and the trolls' shameful acquiescence fostered the trolls' deep resentment and eternal hatred toward night elves. lasting to this very day. The night elf empire at its height. Yet, as the seemingly endless ages passed, the night elves' civilization expanded both territorially and culturally. Their temples, roads, and dwelling places stretched across the breadth of the dark continent. Azshara built an immense, wondrous palace on the Well's shore that housed her favored servitors within its bejeweled halls. There the most powerful nobles, whom she called the Quel'dorei or "Highborne", doted on her every command and believed themselves to be greater than the rest of their lower-caste brethren. The leaders of regions in the night elf empire were called prince/princess, such as Prince Tortheldrin of Eldre'Thalas, Prince Farondis of Azsuna, and Prince Toreth of Loreth'Aran. They continued developing the ability to manipulate and control the Well's cosmic energies to great heights and power not wielded before, even today. Azshara believed the night elves so far had only tapped a small portion of its power. As their reckless experiments progressed, the Highborne found that they could wield the cosmic powers of the universe to either create or destroy with devastating effect at their leisure. Although they agreed that arcane magic was inherently dangerous if handled irresponsibly, Azshara and her Highborne began to practice their spellcraft with reckless abandon performing increasingly dangerous experiments causing waves of arcane energy cascading into the Twisting Nether. Cenarius and many of the wizened night elf scholars warned that only calamity would result from such abuse. Cenarius had watched the night elf empire expand with growing unease. Year by year, he became increasingly frustrated with the hubris and thoughtless actions of the sorcerous Highborne. The majority of night elf society continued honoring the old ways of revering the wilds. The fact that these folk still lived in harmony with the land alongside their great magical advancement warmed Cenarius' heart, but he knew that they had no influence over Azshara and her arrogant followers who's regard for living in harmony lessened as their power and arrogance grew. As time passed, the night elves began eschewing diplomacy and largely ignored Azeroth's other cultures. Azshara's dogmatic beliefs regarding racial purity seeped into the night elves' psyche, creating an atmosphere rife with xenophobia. But, Azshara and her followers stubbornly continued to expand their burgeoning powers. The original Well of Eternity, corrupted during the War of the Ancients. The symbol of the night elves during the reign of Queen Azshara. Thus began the corruption of the elves. As their powers grew, a distinct change came over Azshara and the Highborne. The haughty, aloof upper class became increasingly callous and cruel towards their fellow night elves. A dark, brooding pall veiled Azshara's once entrancing beauty. She began to withdraw from her loving subjects and refused to interact with any but her trusted Highborne priests. The pandaren, long-time allies of the night elf people, saw this change overcoming the night elves and decided to sever all ties. Before they left, the pandaren decided to offer the Highborne a gift, a chest of pandaren design, said to contain all the arcane magic they would ever need. The gift was accepted and taken down into a royal vault in the Temple of Zin-Malor in Eldarath. However when the chest was opened, it was found to contain absolutely nothing. The pandaren's gift was actually a message of advice and wisdom to the Highborne: all the arcane magic they needed was nothing, or in other words, they did not need it at all. The chest and the message it represented continued to exist in the vault even 10,000 years later, but as history would record, the pandaren's wisdom fell on deaf ears. Posing as a venerable god, Sargeras managed to contact Azshara. Sargeras convinced Azshara, and her most loyal assistant, the Lord Counselor Xavius, to open a gateway to Azeroth that this mighty "god" might come forth and "bless" their whole race (meanwhile eradicating all races deemed "unworthy"). In their insolence, those born to nobility, the Highborne, sought to use and control this source of unimaginable power and unspeakable evil; and for their pride, they were consumed by the magic they so eagerly wished to wield. As the portal into the mortal world grew larger, Sargeras sent ever more numerous "emissaries" to aid with the portal and bring the word of their god from the beyond. These demons were members of Sargeras's immortal army, known as the Burning Legion, and they had put to the flame countless worlds throughout the cosmos. As the portal grew close to its completion to allow the dark titan entry to Azeroth, a small band of kaldorei led by Malfurion Stormrage, the first druid, Tyrande Whisperwind, the high priestess of Elune, and Jarod Shadowsong realized the threat posed to their entire world by this nameless evil and the now-crazed Azshara. Realizing his seemingly imminent victory could be threatened by these few elves, Sargeras commanded that his Legion make war upon Azeroth and destroy the unworthy, which included the entirety of the kaldorei race. As war raged across the young world, many protectors of the world emerged to aid the young Malfurion Stormrage in closing this portal to the Twisting Nether and the malevolence which now stood poised to destroy them all. The demigod Cenarius and his fellow Ancient Guardians, the Dragon Aspects, the Earthen, the ancients, the tauren and the furbolg clashed head on with the advancing Legion. Having learned much about the power and beauty of nature from his shan'do, Cenarius, Malfurion was able to disrupt the nearly completed portal spell and close his world off from the invincible Sargeras. "The city of Suramar became the center of night elf worship and home to the Sisterhood of Elune. This order, composed of female night elves, dedicated itself to venerating the moon goddess. The sisterhood's priestesses had a hand in nearly all aspects of early night elf civilization, from acting as spiritual leaders to helping defend their burgeoning territories from outside threats." In time the beautiful city of Suramar, jewel of the night elven empire would become its foremost center for magical research and cutting edge advancements surpassing that of the executive and legislative center of the Empire and rival city, Zin-Azshari. Suramar would host the fabled Nar'thalas Academy in Farondale on its most distinguished province of Azsuna, and would become the foremost center for magical learning, where night elves and even members of the fabled blue dragonflight would ponder together the mysteries of the cosmos and the arcane. Under the wise and strong influence of the sisterhood complexly and totally intertwined with the advanced arcane society, Suramar grew and prospered in excellence, knowledge and discipline alongside faith. The marvels of the arcane alongside the serenity and ethereal beauty of the prayers to Elune that would ascend from its numerous temples such as Falanaar, Faronaar and their headquarters of the Cathedral of Eternal Night. It is this region that would produce the heart of the night elven resistance to Queen Azshara and her new demonic allies. It started with the rebellion of Prince Farondis who on discovering the nature of the Queen's new allegiance, devised a bold plan to rid the world of the demons in one fell swoop by destroy the means they enter the world: the Well of Eternity. He would have succeeded if he was not betrayed by a young noble Vandros too enamored with the Queen. Furious at this betrayal, in display of unparalleled power, Queen Azshara unleashed a spell of devastating proportions in retribution against the elves of Farondis' court that doomed the entire Suramar province of Azsuna to an eternal curse of unliving. Azshara meant this to serve as a warning against any dissenters and quell any ideas of rebellion amongst her subjects empire wide. However as the invading forces of the Legion marched across the hapless cities and territories around the world, the seeds of rebellion would blossom amongst the night elven population in the battle for their souls and the very survival of their world. The heart of rebellion was spearheaded in this region of the night elf empire and the fight would be picked up by Lord Kur'talos Ravencrest of Val'sharah, another province of Suramar. It is to his banner that many citizens of Suramar City and its provinces, including city folk like Malfurion and Illidan Stormrage, Tyrande Whisperwind who would become High Priestess of Elune during the conflict, Jarod Shadowsong and many others from Suramar City itself and surrounding regions would mount a resistance and march towards the capital of Zin-Azshari to stop the Legion and the Highborne of the palace who they at first believed were forcing the hand of the Queen against her will. As battles raged across central Kalimdor, one group of Azshara's servants grew increasingly concerned for their own future. This small sect of Highborne sorcerers acted as an extension of the queen's will in the city. From their headquarters in Suramar, they engaged in covert activities aimed at securing Azshara's rule and strengthening the empire. Of the many duties that these Highborne performed, they excelled at hunting down and acquiring artifacts of great power. Most of these relics were stored in the Vault of Antiquities in Suramar. Amongst them, an extraordinary set of relics that the ancient keepers had used to shape and order Azeroth in ages past. Though Suramar's elite Highborne had pledged their undying loyalty to Azshara, their views on the queen began to shift as the war dragged on. The groups leader, Grand Magistrix Elisande, feared that the Legion did not have the Highborne's best interests in mind. The monstrous demons had already destroyed much of the night elves' glorious empire and poisoned the surrounding land with their fel magics. Elisande's distrust of the Legion only deepened when she discovered that demons were planning to transform Suramar into a new staging ground for the war. Legion agents had begun forming a gateway to the Twisting Nether within the city's most prominent structure, the Cathedral of Eternal Night. Once open, this portal would allow the Legion's reinforcements to storm into Azeroth and crush the night elf resistance on a second front. Yet Elisande thought that such a portal would likely destroy Suramar and everyone who dwelt within. Thus the grand magistrix and her followers formed a plan to sabotage the Legion's efforts. They severed their ties with the other Highborne and moved to seal the demons' new portal. To do so, Elisande and her allies sought out the potent artifacts they had gathered over the years. In particular, they knew that the Pillars of Creation possessed the raw power that they would need to neutralize the Legion's portal. With these artifacts in hand, Elisande and her Highborne led an assault against the demons in Suramar. Just as the Legion's new portal began roaring to life, the sorcerers channeled their magic through the Pillars of Creation. They wove a great spell that closed the howling gateway and locked it with a set of unbreakable seals. Though they had thwarted the attempt to create a new portal, the rebellious Highborne had no plans to join the night elf resistance and continue fighting the Legion. Fearing calamity, Elisande and her followers worked to fortify their holdings in Suramar rather than push with the rest of the resistance to Zin-Azshari. They harnessed the Eye of Aman'Thul, one of the Pillars of Creation, to create an immense fount of arcane magic. Known as the Nightwell, this source of power would nourish the sorcerers and protect them from future threats. In the millennia to come, the fount would also change Elisande and her allies transforming them into a new race of night elves called the nightborne. Nordrassil, planted over the second Well of Eternity and blessed by Alexstrasza, Ysera, and Nozdormu. With so much power in flux, the Well of Eternity imploded in a magical cataclysm known as the Great Sundering, sending untold numbers to their doom. Many kaldorei were dragged to the bottom of the sea, only to be twisted and transformed into the sea serpents now known as the vile naga. The catastrophe tore the continent apart, its remains now separated by a massive ocean, and left a permanent storm known as the Maelstrom where the well once stood. With the majority of the Highborne dead, the kaldorei turned away from their arcane legacy and began a new culture focusing on attunement with nature and their surroundings, settling in the sacred glades around Mount Hyjal. Illidan, Malfurion's twin brother, seeking to maintain arcane magic in the world even after the destruction of the well of eternity had also traveled to Hyjal. Here, he poured three vials filled with water from the original well of eternity into a lake, imbuing it with great power and turning it into a new well. When Illidan refused to give up his magical powers, he was captured by his brother and imprisoned within the Barrow Deeps under the watchful eye of Maiev Shadowsong. Meanwhile the night elves of Suramar were fully shielded from the effects of the Great Sundering due to the efforts of Elisande's group of Highborne. Elisande would come to lead the night elf society under a shield that would both serve as a refuge and prison. Cut of from all events outside, they would for 10 millennia believe they were the only kaldorei survivors of the breaking of the world and under the eternal shroud of night and an artificial sky, these kaldorei would distinguish themselves as shal'dorei, continuing the legacy of the Kaldorei Empire under the shroud of eternal night produced by the Nightwell rather than the starlit night of before. Far away from the center of events on Hyjal and the night elven society that would develop there, another group of Highborne dwelt in the city of Eldre'Thalas, which survived the War of the Ancients mostly intact. Although they took a long time to do it, the Highborne of House Shen'dralar who had processed the Queen's special projects rebelled against the Queen towards the end of the war when their city was besieged by the demons and it was clear the Highborne would not be exempt from their purge. The wolf god Goldrinn had fought bravely besides the city defenders and though he was ultimately slain, the Highborne were successful in defending their city. Far to the south of Mount Hyjal, the Shen'dralar did not draw the attention of the kaldorei. They powered their city by trapping a demon of immense power, Immol'thar, and used its energies to fuel their addiction and lifestyle in the absence of the power of the original well. However, despite their clever efforts, the imprisoned demon that they drew power from would come to require increasing amounts of power on its own until the net power gain became a loss. Subtly twisted by the demonic energies he was using, the Shen'dralar Prince would come to sacrifice his subjects to restore the net gain. This tug of war eventually drove this once bastion of arcana into ruin, with only a few survivors remaining, most of which were zealous supporters of the Prince. For many years, the main night elven body a top Mount Hyjal worked tirelessly to restore what they could of their shattered ancient homeland. Leaving their broken temples, cities and roads to be overgrown, they largely chose to live on the land, out in the open or in barrow dens. They constructed very few new homes constantly on the move in patrols, although a small collection of structures were constructed amidst the verdant trees and shadowed hills at Hyjal's base called Nighthaven and served as the administrative centre from which the High Priestess Tyrande led. In time, the dragons that had survived the great Sundering came forth from their secret abodes. Alexstrasza the red, Ysera the green, and Nozdormu the bronze descended upon the druids' tranquil glades and surveyed the fruits of the night elves' labors. Malfurion, who had become an arch-druid of immense power, greeted the mighty Dragons and told them about the creation of the new Well of Eternity. The great Dragons were alarmed to hear the news and speculated that as long as the Well remained, the Legion might use it to find Azeroth once more. Furion and the three dragons made a pact that the night elves would serve as guards of this new well. Alexstrasza brought an enchanted acorn, a remnant of G'hanir, and placed it in the well, where it grew into Nordrassil, the first world tree. This tree would serve as a means to regulate the power of the new Well masking its energies ingeniously from radiating out into the Twisting Nether to serve as another beacon for the Legion. The tree would also mask its power signature from would-be magic users in the hope of preventing any other society from learning arcane secrets and repeating the disastrous error of the elves. The tree would forever serve as a symbol of the connection between the arcane and nature, the night elves and the natural world, and would use the energies from the well to heal the world after the devastation of the Sundering. Partly in reward for their effort in repelling the Legion invasion, Nozdormu then blessed tree, so that, as long as the tree stood, the night elves would never age or fall prey to disease. Ysera also placed an enchantment upon the World Tree by linking the spirits of the night elves to her own realm, the ethereal dimension known as the Emerald Dream. The night elf druids, including Furion himself, were bound to the Dream through the World Tree. As part of the mystical pact, the druids agreed to sleep for centuries at a time so that their spirits could roam the infinite paths of Ysera's Dreamways and the spirits of the night elves. Though the druids were wary of losing so many years of their lives to hibernation, they agreed to uphold their bargain with Ysera. Tyrande Whisperwind, high priestess of Elune, had become the leader of the night elf populace. For thousands of years, she led the night elves in their vigil. Much of this time was spent apart from her love, Malfurion Stormrage, who, alongside his fellow druids, upheld the balance of nature from within the Emerald Dream. However, whenever a crisis came, the druids would awaken. One such crisis came from the remaining Highborne. The Highborne that had survived the Sundering and had settled alongside their night elf brethren initially tried to assimilate into the new druidic society, but over time they could not ignore the burning addiction to arcane magic their whole race suffered from. These Highborne, led by Dath'Remar, declared the druids cowards for refusing to wield the arcane. Malfurion and the druids warned the Highborne that any use of magic would be punishable by death. Yet, in an attempt to protest the druid's law, Dath'Remar and his followers unleashed a terrible magical storm upon Ashenvale. The night elves could not bring themselves to put so many of their kin to death, so they decided to exile the reckless Highborne from their lands. So the Highborne left Kalimdor, sailing across the sea to the other, newly-formed continent. Now calling themselves high elves, they established the nation of Quel'Thalas. Another such incident was the War of the Satyr, a devastating war that exacted a heavy toll from the night elves. During this war, the night elves fought against the unified satyr forces of Kalimdor. In desperation, some of the night elf druids even started using the Pack Form, a dangerous druidic transformation that had been forbidden by Malfurion Stormrage. These druids would form the Druids of the Pack, who tried to use the mystical Scythe of Elune to gain control over their forms. However, this failed, and they became the first Worgen, before being sealed away in a pocket of the Emerald dream. Though losses amongst the night elves were great, the satyr eventually lost and they lost nearly all of their lands, being forced to survive as isolated sects. However, the biggest war was probably the War of the Shifting Sands. In ancient times, the troll empires defeated the aqir, forcing a group of the latter to retreat into Ahn'Qiraj, an ancient Titan facility. Over the centuries, these aqir developed into the qiraji and came to serve C'Thun, the old god at the heart of the facility. The Silithid, another insect race related to the aqir, also came to serve C'Thun. The night elf forces, led by Fandral Staghelm and Shiromar, fought the armies of C'Thun, but retreated after the death of Valstann Staghelm, son of Fandral, and the loss of Southwind Village. It wasn't until the night elves called for the aid of the dragonflights that the qiraji were driven back. Anachronos, Merithra, Caelestrasz and Arygos, children of the Dragon Aspects, led armies of dragons against the forces of C'Thun. Together, the night elf and dragon forces were able to force the insect armies back to the gates of Ahn'Qiraj. While the battle seemed to turn against them once more, Merithra, Caelestrasz and Arygos flew into the city to create the Scarab Wall, though they were captured as a result. The scarab wall was capable of containing the insectoid armies, trapping them in the city. To one day reopen the gates and truly beat the qiraji, Fandral Staghelm was given a scepter. However, enraged by the death of his son, Fandral shattered the scepter, forever damaging the bond between the night elves and the dragonflights. Battle of Mount Hyjal, the final conflict of the Third War. "These women fight with unmatched savagery! I've never seen their equal. They are... perfect warriors." The night elves' isolated existence was shattered during the third war, when refugees from the Eastern Kingdoms arrived on the continent in large numbers. The orcs, newly fled from the Eastern Kingdoms and seeking resources, had sent the Warsong clan to Ashenvale, unaware of the area's inhabitants. The night elves took great offense to the orcish presence in their lands and attacked. While the orcs had some initial victories, that ended when Cenarius arrived, mistaking the orcs for demons and destroying most of their outposts. In desperation, the Warsong clan once more consumed demon blood, becoming powerful Chaos orcs and proceeded to kill Cenarius. At the height of this conflict — known as the Third War — the Legion and its terrifying undead Scourge assaulted the night elves' lands. Tyrande rallied the night elf defenders and awoke Malfurion and his druids to combat the resurgent threat. For the vast majority of the third war, the night elves remained hostile to the allied Horde and Alliance Expedition. Only during the final battle, the Battle of Mount Hyjal, did the night elves join with the mortal races, standing to defend the world tree. In the end, even this alliance didn't manage to stop the invading demons, but it managed to delay them long enough for Malfurion Stormrage to complete a magic ritual. Archimonde, the leader of the demonic invasion, was torn apart by thousands of Wisps, finally being killed by the world tree itself. Teldrassil, planted by the Night elves in an attempt to regain their cherished immortality. Although victorious, the night elves suffered greatly from the battle with Archimonde at Mount Hyjal. Their beloved World Tree Nordrassil, created and blessed by the Dragon Aspects Alexstrasza, Ysera, and Nozdormu to grant the night elves immortality, had been sacrificed to elicit a massive blast of energy to slay Archimonde. With Nordrassil's destruction, so went the night elves' sole source of protection from aging, disease, and frailty. Over time, Nordrassil slowly began to heal its wounds, but a number of druids led by Fandral Staghelm desired to create another World Tree that would restore the night elves' immortality. Malfurion warned against this act of self-interest, but when he suddenly fell into a coma, his spirit lost within the Dream, Fandral forged ahead with his plans unopposed, becoming the new leader of the druids. The second World Tree, Teldrassil, was planted off the northern coast of Kalimdor, and eventually it towered among the clouds. Within this tree, the night elves founded the great city of Darnassus. However, Teldrassil failed. Though it grew, it was corrupted, and the dragon aspects refused to bless this new tree. After the third war, the night elf nation also joined the Alliance, though the exact moment at which they joined is unknown. They were motivated to do so by the continued logging operations of the Horde in Warsong Gulch. As a result of the Third War, corruption and madness had taken hold of many of the night elves' former lands and allies, severely weakening the strength of the night elf nation. As members of the Alliance, the night elves partook in multiple conflicts, most notably the Ahn'Qiraj War. Not all night elves joined the Alliance however, with the druids of the neutral Cenarion Circle and settled in the city of Nighthaven. Though individual druids still have roles in the night elf nation, the druids as an organization remain neutral to this day, even accepting and training members of the Horde. The Cenarion Circle joined in several conflicts, directing the united Alliance and Horde forces during the Ahn'Qiraj War, launching the Cenarion Expedition after the Opening of the Dark Portal and fighting on the front during the War Against the Nightmare. DEHTA, a radical group within the Cenarion Circle is also active in Northrend, seeking to stop the large-scale hunting of the native animals through violent means. As the corruption of Teldrassil worsened, the Emerald Nightmare spread further and further. By the time the war against the Lich King ended, people throughout the world started slipping into comas, their spirits drawn into the Emerald Dream. It turns out that the nightmare was lead by Xavius, an ancient Highborne noble and the first satyr, thought to have been forever sealed into a tree form during the War of the Ancients. Fandral Staghelm was also involved in this plot, having been responsible for Malfurion's coma, using [Morrowgrain], and the corruption of Teldrassil, having grafted a branch from Xavius' tree-body to Teldrassil. With the aid of other druids and the Green dragonflight, the nightmare was defeated and most of its' corruption cleansed. In the aftermath, Ysera and Alexstrasza blessed Teldrassil, restoring nature's ancient bond with the night elves. Malfurion and Tyrande got married, now sharing rulership of the night elf nation. The Howling Oak in Darnassus provided refuge to the Gilnean survivors of the Invasion of Gilneas. Since the Shattering of the world, a group of Highborne known as the Shen'dralar successfully appealed to Tyrande Whisperwind to be allowed to make a return to kaldorei society. After the Sundering, the night elves had outlawed arcane magic on the pain of death. However, some time before the Cataclysm a Highborne archmage named Mordent Evenshade sought an audience with Tyrande and proposed to set aside long-standing differences and to combine resources, skills and numbers to prepare the wider night elven race for the challenges it faces. Despite the doubts of certain Sentinels, this proposal was accepted. The Shen'dralar were allowed a cautious return among their kaldorei brethren, with some young night elves being trained by them to become new night elven mages, and, conversely, some of the Highborne taking up the druidic arts or being initiated into Elune's priesthood, major societal changes that marked the first steps towards reconciliation between the Highborne and wider night elven society. After an outbreak spread the worgen curse uncontrollably across the war torn nation of Gilneas, the Shattering also destroyed the reefs which protected this human kingdom from naval attacks, causing the Forsaken to launch an invasion. The night elves intervened, assisting the worgen in acquiring the Scythe of Elune, helping them to understand and deal with their transformation and holding back the Forsaken's assault, allowing the surviving Gilneans to escape to Teldrassil. After this, the kaldorei integrated the Gilnean Worgen into their culture; granting them asylum within Darnassus itself, allowing several female worgen warriors to join the Sentinel army and bringing Worgen druids into the Cenarion Circle. Night elf territory was one of the main fronts during the Alliance-Horde war. 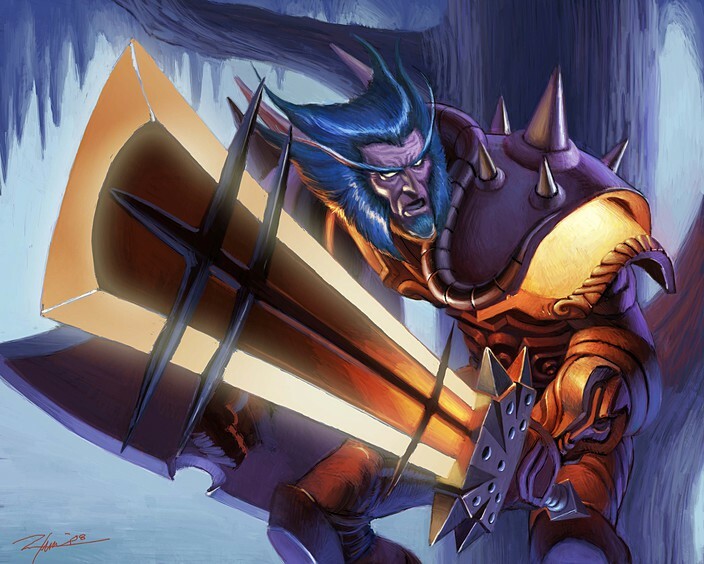 The Shatterspear tribe of Jungle trolls joined the Horde and assaulted northern Darkshore, though the night elves were able to fend off the attack. Two separate Horde offensives were launched against Ashenvale, both stopped by the night elves with assistance from the rest of The Alliance, and, by the time Theramore was destroyed, the Horde had been fully driven from the forest. However, the night elves were not completely successful in their war efforts. Their assault on the new settlements of the Bilgewater Cartel in Azshara was held off, and a massive Horde-constructed bomb destroyed Thal'darah Grove in the Stonetalon Mountains. Though Malfurion Stormrage had become the co-ruler of the night elves, his Cenarion Circle remained a neutral organization, intent on restoring balance following the cataclysm. Malfurion himself halted the slow collapse of Darkshore, with aid from Thessera the Green Dragon, Aroom the Wildkin and Elder Brownpaw the Furbolg. In Desolace and the Southern Barrens, members of the Cenarion Circle investigated the new out-of-control vegetation. In Felwood, a large portion of corrupted soil was cleansed to build Whisperwind Grove. Though most of the Cenarion Circle turned a blind eye to the goblin wood-cutting going on in the region, the Worgen of Talonbranch Glade refused, and broke away from the neutral organization to fight them. However, the biggest contribution for the night elves following the cataclysm was at Mount Hyjal, where Ragnaros invaded to try and destroy Nordrassil and the Cenarion Circle, the Shadow Wardens and the Green Dragonflight united against him, forming the Guardians of Hyjal. The guardians were successful in fighting off the initial fire elemental invasion, resurrecting several of the Ancient Guardians. When the fire elementals invaded again, aided by Fandral Staghelm and his newly formed Druids of the Flame, the guardians were not only successful in fighting them off, but even managed to infiltrate the Firelands, killing Ragnaros and many of his lieutenants, including Staghelm, as well as constructing the Sentinel Tree to keep watch over the area. To restore the immortality of the Night elves, Lorekeeper Vaeldrin was looking for the Pools of Youth, created by an ancient civilization that predated even Queen Azshara. Using a series of ancient magical scrolls, he opened a portal to the Krasarang Wilds. Tyrande Whisperwind, having had a vision of some sort of light, sent a group Sentinels, led by Vaeldrin's daughter, Lyalia, with him. However, the target of the spell had been warded using lost Mogu magic, imprisoning the expedition in a magic bubble that slowly drained their life. Luckily for the expedition, an Alliance adventurer freed them with the help of Kang Bramblestaff, and the freed expedition constructed a base camp to search for the pools. However, it turns out that the pools do not grant their immortality freely. Instead, they are used to transfer life energies from one person to another. During one battle with the mogu, Lyalia is captured and killed. Vaeldrin, using some of the water from the pools, uses his own life energy to save her, resulting in his own death. Despite these setbacks, the expedition is not without achievements, helping the Pandaren fight off the Dojani mogu and aiding in the defense of Stoneplow. Later on, being one of the largest Alliance forces on the continent prior to Landfall, the night elves gained a strong presence at the Shrine of Seven Stars. Shortly after the Alliance lands on Pandaria, a powerful artifact called the [Divine Bell] was discovered. The night elves moved it to their capital for study and safekeeping. However, the city was infiltrated and the bell was stolen by the Horde. During the Siege of Orgrimmar, Tyrande had mustered an army of her people in Ashenvale and began a slow march towards Orgrimmar. After the Alliance and Horde rebel armada landed at Bladefist Bay, Tyrande's forces appeared from the west and, using glaive throwers, managed to destroy the front gate of Orgrimmar. She and her Sentinels then distracted Garrosh's Kor'kron, allowing Alliance forces and Darkspear rebels to invade the city. Several Sentinel guards accompanied the Alliance into Shadowmoon Valley, guarding Starfall Outpost. They also had a small presence in Nagrand and in Stormshield on Ashran. If chosen, they can also guard the Lunarfall garrison. A contingent of wardens, including Cordana Felsong, was sent by Maiev Shadowsong to accompany and protect Archmage Khadgar on the alternate Draenor. Cordana was, however, corrupted by Gul'dan and joined the Burning Legion's side. For more than ten thousand years, the night elves have been bound to nature, shaping their culture into what it is now. Modern night elf society was founded on the very grounds of protecting nature, signified by their connection to the world tree. As one of the longest living races in Azeroth, night elves tend to be slow to change. Slow to anger and slow to cool off, the night elves experience emotions as deeply, or perhaps more so, than the younger races. While generally slow to respond emotionally, their minds have seen much and tend to have a honed wit and sense of humor. The night elves use the word "god" in plural ("Gods help us all"; "May the gods have mercy"), and the Temple of the Moon in Suramar had frescoes and murals depicting Elune and many other gods (actual gods, not demigods) shaping the world. This demonstrates that night elf religion is actually polytheistic, but above all stands Elune, the moon goddess. Her priests, the Sisters of Elune, are the leaders of the night elf military, and her high priest is the official head of the night elf nation, ruling from the Temple of the Moon in Darnassus. The night elves also worship their ancestors. This worship takes the form of offerings, traditionally rice cakes that are blessed in the Temple of the Moon. While Elune is a goddess of peace, she is not a pacifist. One of her aspects is the Night Warrior, who takes the valiant among the dead and sets them riding across the sky as stars. This is likely the origin of the name "kaldorei", as night elf ancestors are thus believed to become stars upon death. The night elves, especially the druids, also have a close kinship with most of the Ancient Guardians, as all known living ancient guardians were last seen on Mount Hyjal. Cenarius is amongst the most ancient allies of the night elves. Aviana is the patron of the Druids of the Talon, while Ursoc and Ursol are the patrons of the Druids of the Claw. Malorne, Aessina and Tortolla are also allies, having assisted the Guardians of Hyjal in the protection of the world tree. Omen, while still corrupted, lies at the heart of the Moonglade. The night elves also have close bonds with the Red, Green and Bronze Dragonflights. The great dragon aspects, Alexstrasza, Ysera and Nozdormu, were the ones to bless Nordrassil and the night elves have worked with them on many occasions since. Ysera is particularly important, as all druids assist her dragonflight in guarding the Emerald Dream. The night elves revere the moonsabers because their shimmering coats symbolize the goddess of the moon, Elune, and they once believed that seeing the dawnsaber breed in the wild was an ill omen. The dark-feathered bird of prey is often seen as a harbinger of doom amongst the druids of Teldrassil. According to the tales of the night elves, the first red-tailed chipmunk was colored so after the theft and consumption of a sacred apple. It is said that the Horn of Cenarius hold the power to call the spirits of all night elves. Long ago, a tribe of nocturnal humanoids came to live on the shores of the first Well of Eternity, and the Well's cosmic energies changed them into the night elves. Certainly many trolls do believe that the humanoids who developed into the night elf race were trolls. The theory does have some credibility, for there is at least a superficial physical resemblance between trolls and night elves. Furthermore, the troll race dominated much of ancient Kalimdor several millennia before the night elves came into power. Nevertheless, many night elves find this theory preposterous and abhorrent. They are quick to point out that the first night elves began their rise to power by defeating a number of nearby troll tribes. As a consequence, the trolls came to fear and respect the might of their new rivals. The troll theory of night elf ancestry may have been a direct result of this early conflict. The trolls hated the night elves—a sentiment that persists to this day—and may have wished to marginalize the night elf race and its accomplishments. Also, attributing the night elf race with a troll heritage likely helped the trolls come to terms with their own shocking defeat. It was only after Cataclysm that Brann Bronzebeard had independent, reliable sources (namely the repaired Tribunal of Ages, the restored Watcher Freya, and the resurrected Cenarius himself) to explain the truth: that the night elves had evolved from a tribe of dark trolls who had found and come to live beside the Well of Eternity. Brann notes that this confirmation will be sure to ruffle some feathers. Prior to the conclusion of the Third War, night elf society was sharply divided by gender, with the vast majority of men being druids and most women serving as warriors, priestesses, or a combination thereof. These gender roles more or less defined the culture of the kaldorei for ten thousand years. Many years ago, the two genders were even forbidden to take the opposite role. When this was finally lifted, it was a tremendous and tumultuous societal change, with a pair of statues created to commemorate the first male priest and the first female druid. Even so, the gender divisions remain strong, and only at the end of the third war were female night elf druids welcomed into the Cenarion Circle. In the years since the end of the Third War, this overall gender division has eased considerably in favor of more practical concerns, and many factions have set aside the historical strictures on membership. More women have taken up the mantle of the druids, just as men have begun to choose either the path of priesthood or more widely the path of war and have affiliated with the Sentinels. Most night elves are, by the standards of other races, ancient. Because of their previous immortality, some night elves are more than ten thousand years old, which is older than the entirety of human and dwarven civilization put together. Though the immortality of the night elves has ended, much of its cultural impact remains, and many amongst the night elves seek for a way of regaining it. After the Cataclysm, both Malfurion and Jarod Shadowsong, alive during the War of the Ancients and with more than a thousand years age difference between each other, have been feeling minor, but increasingly consistent aches and pains due to aging. Jarod's wife, also from the same era, passed away due to illness tied to aging. The night elves are now aging normally, rather than at an accelerated rate. "Were it not for Lady Tyrande's recent mercy towards his kind, his execution would be my duty under the law. He will be watched closely, but I will not deny aid to my sentinels simply out of pride." Before the War of the Ancients, magic was once as revered as Elune herself. For thousands of years, arcane magic has been outlawed amongst the night elves, with its use punishable by death. Even when the night elves joined the Alliance, they still avoided arcane magic. However, just before the Cataclysm, this changed. Archmage Mordent Evershade of the Shen'dralar traveled to Darnassus, seeking an audience with Tyrande Whisperwind. Sensing a coming change (likely the Cataclysm), the archmage offered his wisdom and knowledge to the high priestess. The night elves emerged from their 10,000 year long isolation in the forests of Northern Kalimdor to discover prolific use of magic without the use of the Well of Eternity, something unknown to them but made possible by the implosion of the Well that had dispersed magic from its concentration in the well to the atmosphere. This along with the demons already returned and defeated, Tyrande Whisperwind, finding her people in desperate need of reinforcements and power beyond their current means to face the new challenges to their territories by their enemies and the Cataclysm, and the entire reason for the ban on the use of arcane magic which was to hide Azeroth from the demons of the Twisting Nether in the hopes of preventing a return), was no longer a necessity. She and her husband Malfurion Stormrage, accepted, lifting the millennia long ban of the use of arcane magic for spell and on the Highborne, allowing several of the Highborne to return to night elf society where they entered an alliance that would allow them to train night elves as mages. Although the restriction on magic ended out of necessity, the rift between the people and the Highborne due to the actions the majority of the Highborne at the Queen's palace that led to the first great War would take longer. The humble Mordent understood that the gradual reintegration of magic to their society would be slow process, something the couple appreciated and likely helped to give their consent. Under the agreement, the Highborne would become part of night elf society once more but be allowed to maintain their own identity. However, the reunification has not been completely smooth. The millennia have not stripped the people's memories of the final days of the Great Sundering and the role of the Highborne. That has caused some difficulty with the re-integration. "There is every intention of the Highborne becoming a part of our society again, but such things cannot and will not happen overnight, this is a process that will have to play out over time" - Malfurion Stormrage, and some night elves have been hostile towards the returned Highborne. These few extremists, stirred up and led by Maiev Shadowsong took lethal actions against them in an attempt to purge night elf society of any reminders of the arcane, but such actions were considered crimes against fellow citizens. The new night elf mages have shown remarkable promise and made incredible strides in the short period of time they've re-embraced their arcane legacy. Such promise and desperate need forced new trainees to the front lines in the campaigns that immediately followed the Cataclysm, however despite their phenomenal progress were still very inexperienced, this was exploited by enemies of the night elves to devastating effect. The region of Suramar (known as the Broken Isles) is home to a number of night elven societies including the nightborne of Suramar City who've been in isolation for 10,000 years. In the wake of the third invasion of the Burning Legion, this region who rebuffed the Legion's first attempt 10,000 years ago, now served as the principal staging ground of its new and biggest invasion. Many of the surrounding regions have faced invasion armies of the Legion, most notable was the city of Suramar who had until that moment been isolated and secluded under their protective shield. The nightborne were strong armed by the Legion into bringing down their shield and forced to re-enter the affairs of the world as their allies or face destruction. This time their city was occupied by the Legion who planned to use its immense source of power, the Nightwell to finally achieve the victory that had twice eluded them. The kaldorei denizens of the region rose up in defense alongside the heroes of Azeroth, converging on the Broken Isles. Many ancient night elven orders and forces such as the Valewalkers or Keepers, the Moon Guard, the Court of Farondis have all combined their efforts with the nightborne resistance to end the occupation of the Legion, liberate the people of Suramar and ultimately the world, freeing the elves from their addiction to arcane magic and the Nightwell. Most recently, a kaldorei army led by High Priestess Tyrande joined forces with the Kirin Tor, high elven and blood elven allies to assist the nightborne resistance drive out the Legion overthrow its once brave leader. It is the first time all the divergent groups of elves have worked together. For thousands of years, the Sisters of Elune held by far the most power; as one of a small handful of kaldorei organizations to survive the War of the Ancients, with membership based upon aptitude and not lineage, high priestess Tyrande Whisperwind reorganized the order to direct the Sentinels. She herself became the sole ruler of the night elf nation, remaining that way for thousands of years. Recently however, changes have come to the night elf government. Following the marriage between Tyrande and Malfurion Stormrage, the latter became co-ruler of the night elves, the first change in official leadership in the past ten thousand years. The Cenarion Circle, before his death still under the direction of Cenarius himself, took no active part in governmental affairs, as their numbers included druids from several other species. Though Archdruid Stormrage did take part in the government on occasion, the druids typically remained aloof. "Many craven races have tempted our wrath over the centuries. None have survived!" By the time of the Great Sundering, military service for the night elves had become more a matter of bloodline than ability. Almost all high-ranking officers were nobles, and the night elves had lived in peace for so long that very few of those officers, however privileged and well educated, possessed even a basic knowledge of tactics. Joining the army, once a selfless choice to defend the night elf people, had been reduced to a status symbol. The War of the Ancients made the army's deterioration all too clear. After the night elves and their allies had achieved victory, High Priestess Tyrande Whisperwind decreed sweeping changes throughout night elf society. As part of these changes, Tyrande disbanded the old army, most of which had no desire for further battle, and established the Sentinels. The night elf sentinels are considered great warriors, fighting with savagery and skill that amazes even the greatest of warriors. The sentinels care little for melee combat, instead relying on their trusted bows and throwable three-tipped glaives. Swords, scimitars, daggers and the two-tipped glaives more commonly associated with Demon Hunters are seen only in isolated cases. Supporting the sentinels in battle are the druids, the Sisters of Elune and the Watchers, all of whom bring powerful magic to aid in battle. Night elf technology is rather limited however, and the only commonly employed technological war equipment seems to be the Glaive Thrower as seen throughout night elf territory. Rather than rely on technology in battle, the night elves instead bring their natural allies. Amongst these many, many allies are Owls, Sabers, Hippogryphs, Dryads, Keepers of the Grove, Nymphs, Treants, Chimaeras, Faerie Dragons and Ancients (see notes for controversy). Furbolg, Wildkin, green dragons and storm crows are also allies of the Night elves, but don't appear to be integrated in their armies. Wisps can also be found among the crews of night elven boats. Moonwells are used to create blessings that offer protection against fire and are used to bless [Warden's Arrow]. A nightblade stalks her victim. Though many within the kaldorei still felt bitter about the role orcs played in Cenarius' death, hostilities were not renewed until the Horde continued their lumbering operations in Warsong Gulch. These Warsong incursions into Ashenvale renewed the night elves' animosity towards the orcs and have therefore functioned as the catalyst for their participation in the Alliance's military endeavours. Despite this, diplomatic relations with fellow druid tauren and their respect for Warchief Thrall has tempered the night elves' wrath. To avoid all out war, the night elves have even allowed open trade with the Horde until the Wrathgate incident strained their trust, consequently leading to a withdraw of all trade contracts as well as a barring of any Horde member from Ashenvale. When the orcish territory of Durotar suffered from a terrible drought, the orcs' new warchief, Garrosh Hellscream: son of Grom Hellscream, launched an invasion of the night elven lands of Ashenvale to sustain his people. The conflict between the orcs and the kaldorei since then escalated so fiercely into open warfare that it even began to involve several of the ancients and the Children of Cenarius. There appear to be some culture clashes between the night elves and the other races of the Alliance. Some kaldorei have expressed thinly veiled contempt for the other cultures or mortals of the world. Traditionalists within night elven society, notably former Archdruid Fandral Staghelm and Warden Maiev Shadowsong, have shown open antagonism or contempt for what they consider to be "lesser races" and "outlanders". The shadowy nature and the wild conservative ways of the night elves have also led to awkward or strained interactions between the kaldorei and other races. For example, the night elves seem to be uncomfortable with the Alliance's obnoxious use of technology while the Alliance view the night elves' primal form of warfare and lifestyle as somewhat primitive. Even so, Malfurion Stormrage and Tyrande Whisperwind see merit in maintaining ties with the younger races within the Alliance, for they have shown resilience in the face of terrible adversity and have even earned the favor of Elune and Wild Gods such as Goldrinn. As a result, the night elves have positioned themselves as a peculiar mixture of observers, teachers and arbiters; watching silently from the sidelines and stepping in without warning to 'correct' any dangerous mistakes or 'naive' courses of action. In addition, the younger cultures do seem to possess one quality the kaldorei have been missing for quite some time: the enthusiasm of youth. Adventure and exotic locales have renewed their appeal to many night elves, and the kaldorei again have more than a few who brave leaving Teldrassil and Ashenvale to seek out intrigue in the far-off lands their people have not set foot on for ten thousand years. With the recent loss of their immortality, the mortal races of the Alliance have also shared their experience with the night elves on how to cope with death, frailty, and sickness. In line with Malfurion's stance on the races of the Alliance, druids such as Talar Oaktalon advocate living in harmony with all life and the interconnectivity of all living things. Thus the druids have encouraged the sharing of ideas and the lending of mutual aid. Indeed, the kaldorei have become increasingly involved in many Alliance affairs that focus on the protection and restoration of Azeroth's natural world. In the Plaguelands, the night elves have made it their mission to cleanse and restore life to the land, whereas the other races focus primarily on eradicating the lingering Scourge. In Northrend, kaldorei can be seen empowering the wildlife in the very heartland of the Lich King's seat of power. In Thousand Needles, there was an instance of night elf sentinels temporarily joining forces with tauren refugees to rout the marauding Grimtotem tribe. Most notably, after the human kingdom of Gilneas was jolted back into the outside world in the Cataclysm's wake, the Forsaken launched an invasion of its lands. The kaldorei, being well aware of the druidic origins of the curse afflicting the Gilneans, lent their aid to the besieged kingdom and granted the worgen asylum within Teldrassil's borders. A particularly lingering grudge lies between the kaldorei and their Thalassian descendants: night elves generally view the high elves and blood elves with disgust, suspicion, or outright hostility. Though a few high elves have rejoined the Alliance in recent years, the night elves (who joined during the Third War) opposed this notion, seeing it as their duty to warn their new allies against the high elves. The Highborne's part in bringing about the War of the Ancients figured heavily in the night elves' retelling of high elf history. Despite the grudge, the high elves and the night elves collaborated on a few occasions in the past. Emmarel Shadewarden and her forces helped the high elves fight off an Amani troll incursion, and Shandris Feathermoon met Ranger Captain Areiel two or three thousand years ago. Initially, the night elves and blood elves had joined forces in Warcraft III: The Frozen Throne, and Tyrande, Malfurion, and even Maiev worked cordially with Kael'thas Sunstrider and his troops, who treated their older brethren with respect despite their peoples' past conflict. Tyrande grieved for the deaths of Kael's brethren, encouraging the blood elf prince not to allow vengeance to poison his heart, and to instead focus on leading his people into a brighter future. However, when Kael'thas Sunstrider allied with Illidan Stormrage who was still then regarded as a traitor and the mysterious serpentine naga later fleeing to Outland and believed to be in league with the Legion. Relationships soured and the night elves warned the Alliance about the blood elves' past. The last of the good overtures vanished when the night elve sent a military expedition to Quel'thalas, an hostile move that was answered with force by the blood elves. This was the first recorded killings between the two groups, escalating the negative aspects of their relations to open and violent conflict. Since then, the night elves and blood elves have clashed in several confrontations under the banner of the Alliance and Horde, in particular the Horde invasion of Azshara, Ashenvale and Desolace shortly after the Cataclysm. Years later, to aid the Nightfallen rebellion within Suramar, Khadgar issued a call to any who could spare forces to help, and both kaldorei and sin'dorei answered. Although they now faced a common enemy, the elvish groups remained bitterly divided over historical, racial, and cultural differences. The night elves ghosts of the Court of Farondis reside in Azsuna on the Broken Isles. Deceased night elven ghosts can also be raised into banshees and spectres. The primary language of the night elves is Darnassian. Due to ideological differences between the night elves and their distant kin a linguist must take great care in drawing comparisons between Darnassian and its two cousin languages (Nazja and Thalassian), because the night elves find such comparisons offensive. All night elves have also learned Common in order to better relationships with the Alliance. Like humans, elves are often addressed by just their first name, or with their rank/position and their last name. However, there are a number of elves that use single names and don't fit this pattern. Compared to their peers in the Alliance, the night elves are rather limited in their use of technology. Instead, they rely on their magic and the benefits of the natural world. That doesn't mean the night elves are primitives however. Traditional night elf architecture shows that the elves are quite skilled at building and stonecraft, and traditional night elf weapons include the metal glaives. In battle, the night elves also deploy simple mechanical weaponry, most notably Glaive Throwers. The night elves' lifestyle is not "anti-technology", however, but rather one where technology is not the goal. Apparently, night elf sentinels are okay with and capable of using guns, but still seem to prefer their bows and throwing glaives. Highborne used memory crystals created by ancient sorcery to store stories, music, history, and even memories. One of the night elves' most important basic ingredients is rice flour, with most families keeping at least one basket of rice in their houses. Wild ricecakes are made in the north of Kalimdor according to a traditional night elf recipe. The most well-known night elf recipe is kimchi, made of fermented vegetables and sold by vendors throughout night elf territory. To ferment these vegetables, night elves bury pots with vegetables. [Spice Bread] is also common, eaten almost every day. Pine nut bread is an ancient kaldorei staple; as the night elves of Darnassus revere nature, it is no wonder that their signature bread features ingredients foraged from the forests of Kalimdor: wild hive honey, pine nuts, and mixed herbs. Additionally, it is often formed into the shape of a leaf to honor Teldrassil, the World Tree. Passed down from the night elves' forebears, this ancient recipe makes for a scrumptious accompaniment to pastas and stews. Ribs, spider kabob, sweet potatoes, lunar pears, moonberries, eyes of Elune (seemingly a kind of apple), sunfruit, Darnassian bleu cheese, baby octopi (sometimes eaten while still alive), herring, clams and whitefish are also known to be part of night elf cuisine. Bean soup is a popular dish among the night elves. While nowhere near the partaking of libations that the dwarves are known for, the night elves are familiar with alcohol. Even in ancient times the kaldorei made Darnassian wine, distilled from ginger and which was mixed and/or stored in amphorae. In the Broken Isles, the vintage continues to be produced by the nightborne. Moonberry juice is another kaldorei beverage. Moonwells are used by night elves to bless food stores. Night elf burial is done naturally, returning the deceased to nature. Disturbing the remains of those who have fallen is gravely looked down upon, but sometimes viewed as necessary based on circumstances. When a night elf's mount perishes, it is custom for the rider to keep one of the saber's great fangs as a token of remembrance. Night elf children are given an owl feather on their first birthday as a token of good luck. Prior to the proliferation of druidism, most night elves slept during much of the day when their link to the Well of Eternity was at its weakest. Bracers of Kinship are symbols of a sacred bond of friendship, trust and love amongst night elves. Superstitious elves believed tarot cards could reveal the future. The night elves harbor a deep respect for life. They do not torture prisoners, nor do they take delight in unnecessary casualties. Reason: May as well trim a bit. 3D model of a night elf female. "They almost look like elves. But they are far too tall, and far too savage." Ever since night elves made first contact with the Alliance races, there's been a long-standing debate as to whether they had any relation to trolls. Responses from either of the two races reside on opposite ends of the spectrum. Night elves will flat-out deny any sort of ancestral ties to their historical mortal enemy. On the other hand, tribes like the Zandalari and the Darkspear may begrudgingly admit that at one time the kaldorei were indeed their kin. Proof of a common ancestral link was discovered by Brann Bronzebeard, the famous dwarven archaeologist. He confirmed night elves descended from none other than the fabled dark trolls of Kalimdor. Refer back to the early beginnings of the Kaldorei, and you will notice their physical forms resemble very little of the exotic beings seen in modern times. As a tribe the dark trolls were nomadic in nature. A sect of these nomads settled on the shores of a vast lake known today as the Well of Eternity. The waters of this fount were profoundly magical in nature. As they remained exposed to the Well's energy for long periods of time, the appearance of the dark troll settlers eventually transformed. Dark trolls were darker in complexion compared to most other trolls. Their skin was a deep violet with complimenting black or dark blue hair. They stood upright with lean, corded muscles; bearing tattoos which covered their faces and bodies. As they changed, their slenderness became accentuated. Hands and feet evolved into more fingers and toes. Ears that were once large and wide became longer, thinner and more tapered. Even in their eyes a curious silver glow emerged which mirrored the light of their loa goddess, Elune. With the dark trolls' new form came a new name for themselves: kaldorei. This is the form we are familiar with today. Where dark trolls had mainly dark violet skin, the skin tones of night elves fall into a broad range of the purple spectrum. Colors may vary from the darkest orchid to the faintest pink. Some individuals may even appear various hues of cerulean or bear a pale milky, opalescent shade of white. In rare cases, you may come across a night elf with a ruddy, almost rouge like skin. Hair color has also extended into more variants over the dual tones attributed to dark trolls earlier in this section. Starting out with sapphire or even obsidian hair, night elf hair has sprouted into a panorama of azures and violet; followed closely by greens and even silver that boarder on white. Autumnal tinctures such as red, amber, blonde and brown were, for a time, common colors; though this striking feature was found primarily among the Highborne ruling class. Hair styles among night elves are similar to those of the Quel'dorei and Sin'dorei, albeit a bit more wildly and free flowing. Unlike most of their elven cousins, Kaldorei men often have thick, elaborate beards and bushy eyebrows. Over the past fifteen millennia, a tall stature and long, tapered ears have become favored traits in all bloodlines. While the reasoning for this may be a lost tradition to celebrate their identity as night elves, their exotic appearance has had a tendency to be initially greeted with admiration, fear or mockery by other races. Much time has passed since the Third War when night elves first met the Alliance, however. The presence of night elves, especially of the young adventuring variety, has become more commonplace in cities like Stormwind. For the average Kaldorei, peak physical health is one aspect of achieving overall personal harmony. Individuals can spend centuries sculpting their form to perfection for both aesthetic appeal and battle prowess. Through generations of this practice night elves have developed a slender, athletic frame that carries them with each graceful stride. Night elves are natural warriors built for deadly combat, and their dense musculature packs a punch with the heft they throw behind it. If weight and height ratios are similar to humans, we can expect an average kaldorei female to weigh about 200 lbs and a male roughly 250 lbs. Male Kaldorei are sinewy, with broad chests and shoulders, indicative of the strength within both their minds and bodies. Female night elves are lithe and curvaceous, yet still muscular and strong. Both genders continue to stand in an upright posture as their ancient ancestors did; and maintain their tall, imposing statures. The average height for a female night elf is approximately 7 feet tall and the average height of a male is approximately 7.5 feet tall. The in-game height for female night elves is 6'10" and for males 7'2". An appropriate height range would be to add or subtract half a foot from either gender. A full grown Kaldorei under 6' 5" is nearly unheard of, and would be considered unnatural, or even an abomination by some. Shorter elven statures are ascribed to Quel'dorei and Sin'dorei, the untrusted and mortal enemies of the night elves respectively. Females will tend to bear facial tattoos that frame their eyes. The style of the tattoos usually have deep meaning to them. Males may have tattoos on their chests, and uncommonly around their eyes like Malfurion Stormrage. Contrary to what a casual observer might believe, night elf eyes still have pupils, just as the eyes of many other humanoid races do. These pupils can be difficult to discern, particularly under certain lighting or from certain angles. Although in-game models show female night elves with glowing silver eyes, while the male's eyes have an amber glow to them, the two eye colors are not exclusive to gender, and golden eyes are starting to become more common. While not noticeable while the mouth is closed, when speaking to a night elf one can often spot the long upper canines they posses. When a night elf is embarrassed, their cheeks darken to black or a darker shade of purple. While gathering lumber from Ashenvale for Thrall's war effort, Grom Hellscream, unaware of the night elves' identity, remarked that they looked "like elves, but they're far too tall, and far more savage". Before the Sundering, golden eyes were extremely rare among the night elves. Golden eyes thus came to be regarded as a sign of future greatness. Night elves born with them were recruited into the Moon Guard. Both Queen Azshara and Illidan had these unusual eyes. Unfortunately the falsehood of this widespread belief was only to become clear after these two infamous individuals had reached their dark fates. In truth, golden eyes were a sign of strong druidic potential. Little wonder that pre-Sundering night elves, with their emphasis on the arcane, did not understand the significance of these unusual eyes. Simply having this potential did not guarantee that the potential would be sensed or understood, much less wielded with skill and compassion. Despite his golden eyes, Illidan struggled with the druidic arts, though he, like Malfurion, was tutored by Cenarius. Innate druidic power does not necessarily lead to becoming a druid, and lacking that innate power does not preclude becoming a druid. Indeed, Malfurion was born with eyes that glowed silver, but he studied druidism, and his wholehearted dedication gave him a power and skill far beyond most druids. As he continued to use druidic magic, his eyes acquired the golden incandescence that had once been so coveted by other night elves. Golden eyes quickly became far more common. After the Sundering, night elves abandoned their former obsession with bloodlines, and so the number of night elves born with golden eyes increased significantly. In addition, the night elves resolved to be more respectful of Azeroth, and a number of night elf men followed in Malfurion's footsteps; these new druids eventually also had golden eyes. Traditionally night elf women served their people as warriors, hunters, and protectors. Many spellcasting vocations, on the other hand, were generally considered the realm of night elf men. Only since the devastating casualties of the Third War have these conventional gender roles been set aside. Because druids only recently opened their ranks to women, golden eyes remain somewhat more prevalent among night elf men than their female counterparts. The symmetrical markings worn by many night elf females do have some meaning. They choose their facial markings sometime after adulthood, and they can mark an earlier rite of passage. Though they don't necessarily have to, some night elves feel they should. It is not yet clear what the rite of passage consists of or whether the act of tattooing itself is the rite of passage. Tattooing represents their close ties with nature, and stylized claw marks are a typical tattoo. Night elves of Suramar, before becoming the Nightborne after the great Sundering. The following were once kaldorei, but have been transformed into other races through magical means. Night elf allies in the RPG. Night elven society has changed since the battle of Mount Hyjal, and the Sentinels now function in an entirely different manner. As the Burning Legion threat has been averted, at least for now, the night elves are no longer considered in a state of war. After the events of the Battle of Mount Hyjal, the night elves severed all ties with the Horde in response to Cenarius' death at the hands of the orcish champion Grom Hellscream, maintaining a tentative relation with the Alliance alone. Directly afterward, many sentinels, druids and warriors of the kaldorei began a great wild hunt of orcs across Kalimdor as a retaliation for Cenarius' murder. Realizing they needed help to survive in this new world and to oppose the Horde, which chose their continent as its new home, the night elves reluctantly joined the Alliance. Commerce began between Theramore and the night elves, as the two cultures shared values and ideas. The night elves remained withdrawn, however. There are still many places considered too sacred for dwarves or humans to venture into, and only when they’re drunk do they really loosen up around other Alliance races. The night elves worship the Ancients, who are nature deities attuned to the forest and the hunt. Elune the moon goddess and Malorne the Waywatcher are the most prominent figures of worship. While Cenarius has died, and the night elves will never forgive the orcs for this, his children live on and gain power each passing year. The night elves venerate the children of Cenarius as he was venerated, and perhaps one day these children of the slain demigod will aid the night elves in repaying the orcs for the transgressions of the past. Some night elves also worship dragons. The Sect of the Dragons hosts many kaldorei adherents. It is not currently known how many kaldorei actually worship the dragons. The night elves once worked with orcs to halt the Burning Legion, and now they retain knowledge of the race's language for tactical reasons. Night elf names always have a special meaning. First names derive from an elven word or the name of a famous hero having a totemic or ancestral connection. Surnames are indicative of the family line and often date back millennia. Rather than drawing from the chaotic and darker side of magic, theirs is pulled from Azeroth itself. Stone, root, flora and fauna all are avenues through which their magic travels. Druids are able to change into animal forms, snare their foes with roots or harden their skin like tree bark. Their warriors are not to be taken lightly either. The night elves are among the most deadly adversaries to be found anywhere, due to a combination of their proficient skill with a bow, their stunning agility, and the ability to melt away into the shadows of the night. Few use common weapons such as swords, most preferring the mighty glaives (triple-bladed swords) they have grown accustomed to. War panthers, hippogryphs and even the mighty chimaeras and mountain giants have all been known to aid the night elves in battle. For ten thousand years, all night elven war and "foreign policy" has been based solely on the safety of Ashenvale Forest and Mount Hyjal from outside incursion. The Sentinels, hidden safely among Ashenvale's leafy trees, effectively sealed off the region from unwanted interference for ten millennia. The Sentinel's method of deterrence was successful until the invasion of the Legion-endorsed Scourge; at which point the night elves were forced to awaken the Druids and accept aid from the Alliance and the Horde. Night elf males are very tall, range between 6'6" (198 cm) and 7'6" (229 cm), with broad shoulders and a lithely muscular torso whereas females are far more slender. The men are typically of a slim-waisted yet firm, muscular build including long, muscular arms and large hands. The women are quite different, standing between 6'2" (188 cm) and 7' 2" (218 cm) in height. Night elves are imposing in stature, males being on average 7 feet tall. Male kaldorei are very muscular, with broad chests and shoulders, indicative of the strength that lies within both their minds and bodies. Female night elves are lithe and curvaceous, yet still muscular and strong. The race's prominent eyebrows, long pointed ears and natural aspects imply a feral grace. Skin tones range from pale white to blue or even ruddy red, and their hair ranges in color from bright white to woodland green to lustrous black. While there are examples of elves with golden eyes, certain night elven druids have been seen with glowing green eyes, usually while casting or under the influence of a druidic spell. Glowing green eyes have also been seen on a night elf warrior however, so the color may be a natural occurrence. Early night elf concept art. Several items introduced in the Legion expansion used to spell kaldorei as "kal'dorei". These have been corrected in patch 7.2.0. Although some misspells remain. Such as the on-use text for [Kaldorei Light Globe] still using "Kal'dorei". According to Medivh, the kaldorei sometimes captured the nascent humans and used them to build their empire. The night elves were originally based on the Drow from the various Dungeons & Dragons campaign settings. The gender divisions (warrior and ruler women and magically-inclined men), darker-hued skins, and a very powerful goddess are the only elements of this that survive. The night elves were originally envisioned as jungle-like insect riders when making the concept for Warcraft III'. The night elves were actually referenced several times in Warcraft lore long before their unveiling as the fourth race in Reign of Chaos. There is a reference to the night elves in Day of the Dragon and Medivh actually narrates the story of the kaldorei, the Well of Eternity and the War of the Ancients to Khadgar in The Last Guardian (published before the unveiling of the night elves), as a warning against magocratic arrogance. The architecture of the night elves, according to an interview with Chris Metzen, draws its influences from both Nordic and Japanese building style. This is most obviously apparent in the night elf city of Darnassus, which includes several tower buildings in the style of the Pagoda at Yakushi-ji (薬師寺). Metzen specifically based elements of the night elves' architecture on the city of Asgard from Marvel Comics (in turn based on the realm of the same name from Norse mythology) as depicted in Walter Simonson's run on The Mighty Thor. The male night elf's dance is based on Michael Jackson's Billie Jean. Alizée's dance from "J'en Ai Marre" was the influence for the night elf female dance. This led to Blizzard joking about it by writing in an in-game book that some night elf females are rumored to dance on mailboxes and stripping to pay for their nightsaber training. One of the male jokes is "Who wants to live forever". This is a Queen song written for the movie Highlander, in which the last immortal being of good must battle an equal force of evil for "The Prize" — ironically, mortality — which is what the night elves receive in the destruction of Nordrassil. Prior to Cataclysm, night elves were the only race that could front flip. Post-Cataclysm, the worgen have learnt to front flip. The night elves appear to be almost the exact opposite of the blood elves and differ in somewhat ironic ways: while the night elves' beliefs are linked to the moon, the blood elves' beliefs are linked to the sun. The night elves's eyebrows clip with nearly every hat in-game. This is because only hair is changed upon wearing a hat and the face remains the same. The same applies for blood elves and high elves. Female night elves are voiced by Debi Mae West. The voice actor for the night elf men is not yet known. The dark elves mentioned in Day of the Dragon could be night elves. Original night elf male model. Original night elf female model. Night elf male model from 6.0. Night elf female model from 6.0. Night elf male demon hunter. Night elf female demon hunter. Dragon Ysera in her night elf form. Warcraft III: Reign of Chaos box art. World of Warcraft box art. Night elf archer and druid. Night elf hunter vs blood elf rouge. Battle for Azeroth concept art. Night elves moments before the Sundering in Warbringers: Azshara. Eternity's End campaign menu background. Terror of the Tides campaign menu background. ^ Original lore had Malfurion making the decision, later stated at  that Tyrande, as the head of the government, did it. ^ World of Warcraft: Cataclysm - Class combinations (JPG). Blizzard Entertainment. Retrieved on 2010-01-31. ^ The guards at the shrine are either night elf, or one of the night elves' natural allies. ^ Seen primarily in Warcraft III, supported by the night elf guards using the same weapons. ^ Gathering Thunder! : Thrall citing the war with night elves for lumber as reason for their animosity in the Theramore Summit. ^ A sampling of names taken from World of Warcraft and the Trading Card Game. All used names belong to characters whose names are not references or jokes. ^ Knaak, Richard A.. "Two", The Demon Soul, 40 (ebook). ISBN 978-0-7434-7120-6. ^ a b c d e f g h World of Warcraft: The Roleplaying Game, pg. 38-39. ^ Rob Baxter and Luke Johnson. World of Warcraft: The Roleplaying Game, Core Rules 2nd Edition, page 39. Sword & Sorcery Studios, 2005. ^ Barkskin (March of the Legion), Official TCG Artwork. ^ Brace or Mace, Official TCG Artwork. ^ Staff of Trickery (Wrathgate), Official TCG Artwork. ^ Rayne Savageboon (Drums of War), Official TCG Artwork. This page was last edited on 11 April 2019, at 02:42.